In Part 1 I made the case for Why natural light is best for outdoor portraits. But, that’s not all there is to it. If you are a professional you should be exerting some control over natural light, just as we do in the studio, creating lighting patterns that give your subjects three dimensionality and depth. I see too many “natural light photographers” just plunk their people down in the middle of an open field or conversely they march their subjects into a forrest of trees looking for maximum shade and they usually get too much of a good thing! In both of the above scenarios all they end up with is FLAT LIGHT; as professionals we should do better than that. The challenge doing portraits by natural light, two hours or even one hour before sunset, is NOT that there is not enough light—it’s that there is TOO much! There’s light bouncing all over the place and from multiple directions. So, the solution in controlling this light is NOT ADDING LIGHT—it’s SUBTRACTING LIGHT! The subtractive lighting technique is simple, natural looking (dare I say organic?) and Way less expensive than using flash. Most importantly it’s seamless (it’s invisible). This technique does not reveal itself the way flash always does. To subtract light I use a GOBO (from: go-between)—a term from my cinematography days. Anything that will block light enough to create a nice shadow side on my subject’s face will do as a GOBO. 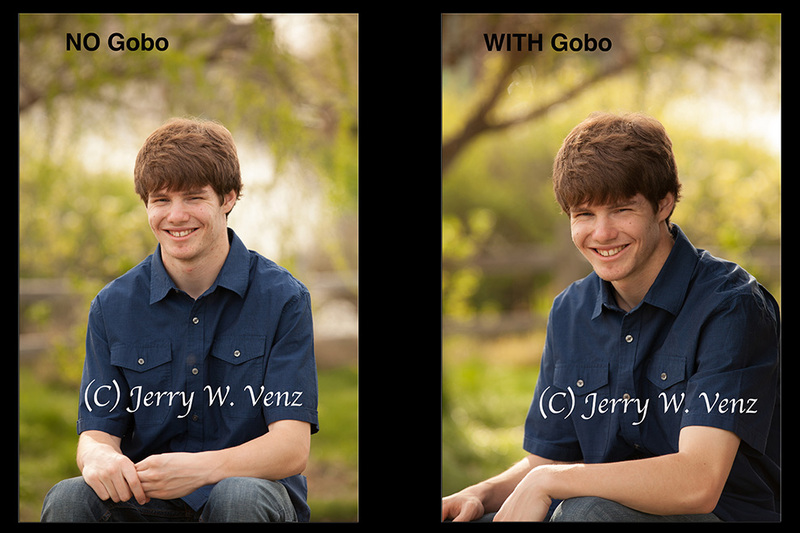 For groups (the most difficult subjects) I use Large Natural Gobos, like trees, rocks, or buildings. 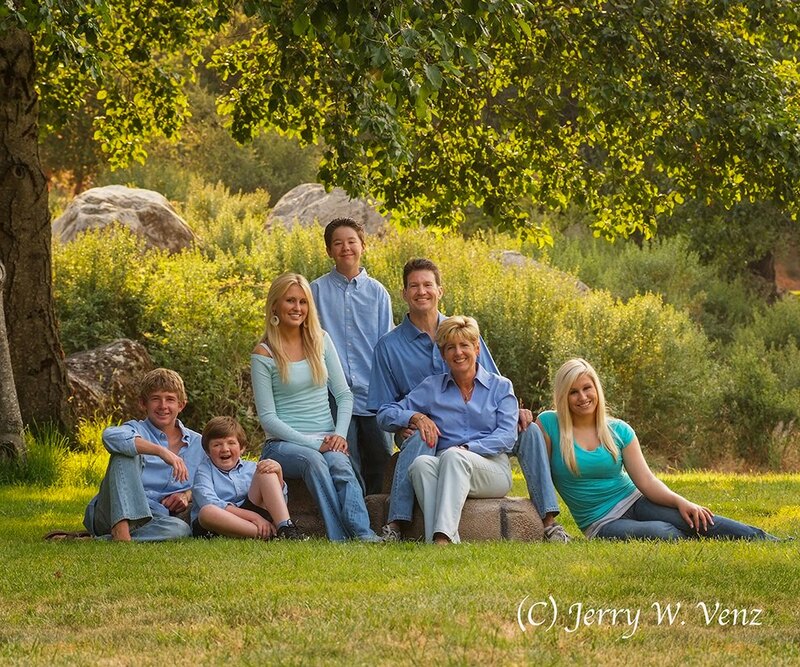 On the family portrait above I created directional, three dimensional lighting using several large trees (my Gobo) on camera LEFT and, by placing my group, NOT UNDER the tree’s canopy (critically important! ), but at the outside edge of the canopy. Placing them inside the tree’s canopy is like walking deep into a forrest; you’ll just end up with flat light. That way the entire group is lit by a big patch of blue sky, while the setting sun provides some nice back light. The Natural Light Rule: As my first lighting mentor (the late, great, Leon Kennamer) taught me, “The Light is at the Edge of the Forrest”! Natural Gobo Note: If the Gobo you’ve chosen does to create a shadow side on your subject’s face then it’s a reflector—move your subject elsewhere! It’s really easy creating a nice shadow for individual portraits; even in the worst lighting conditions. For individuals our Gobo in a flat lighting situation when there are no natural gobos (like trees) nearby is the hand held flag or black flat (aka your Gobo). 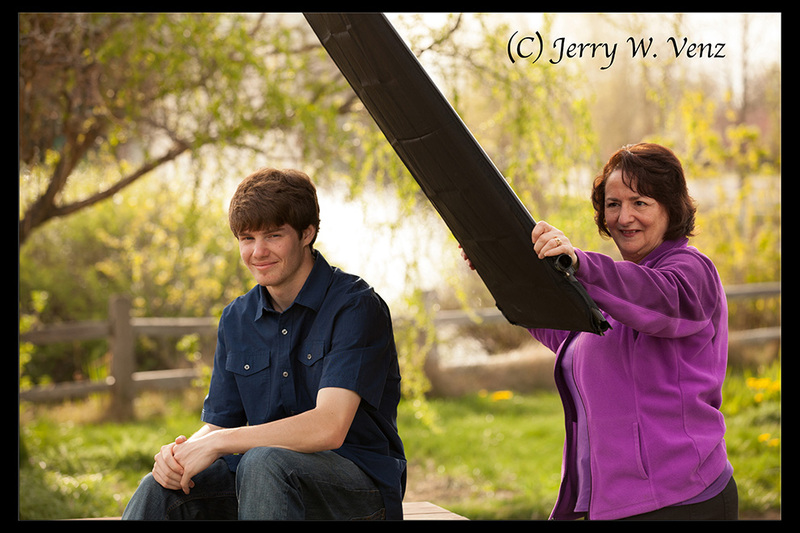 Here Kathi, my wife and partner, demonstrates the proper technique to block side and top light, using a 42” black flag, close to the subject, creating a nice dimensional shadow on the young man’s face. Here’s the before and after images of the young man. We just sat him on a park picnic table out in the open. The image on the LEFT is just plain flat light—we have equal light on each side of his face. In the Image on the RIGHT, the black flag completely changed the portrait giving the light direction and creating depth. The only other thing we did was to turn him—so he’s not posed flat to the camera. This pose is generally more flattering to the subject and it puts more of the face in shadow creating “short lighting”—one of the best lighting patterns for portraits. In this next example, we have our high school senior model, Jasmine, in a popular alley (called “Freak Alley”) in downtown Boise. The sun is setting on camera left and was striking her face, which is something I usually avoid. The sun was also reflecting off a tall, mirrored, building on camera right. So, I had Kathi block the direct sunlight, on the left, with the 42” black flag, creating a nice shadow side on Jasmine’s face. Using true natural light, modified with the subtractive technique, will produce superior portraits that will ALWAYS look more natural than ANY flash technique. In addition, with the money you save not buying speed lights, soft boxes, stands, weights, and radio triggers, you can invest in a really nice portrait lens. How’s that for a WIN-WIN! Larson still has the 42” square rig that I use and they call them Gobos. F.J. Westcott has their Scrim Jims in Flat Black Block or their Illuminators in Blocking Black. Or…you can make your own Gobos using foam-core panels painted black.